Dr. Mark J. Shepard is a board-certified orthopaedic surgeon with expertise in sports medicine and arthroscopic and reconstructive surgery of the shoulder and knee. Dr. Shepard completed his undergraduate studies at the University of Notre Dame in 1985. He earned his medical degree from Washington University in St. Louis in 1989, serving as president and commencement speaker for his class. 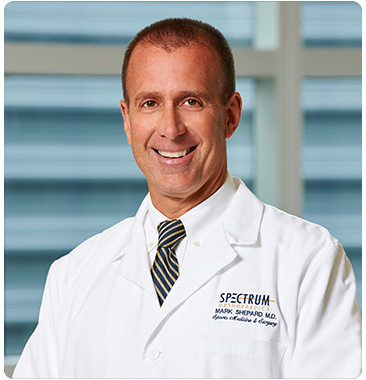 He completed his residency in orthopaedic surgery at the Yale New-Haven hospital in 1994. Dr. Shepard then completed a fellowship in sports medicine at the Kerlan-Jobe Orthopaedic Clinic in Los Angeles in 1995. Dr. Shepard is an instructor in orthopaedic surgery at the Northeastern Ohio Medical University and the Walsh University program in physical therapy. He currently serves as team physician for Walsh University athletics and is a consultant for Malone University and local high school sports teams. He has completed several orthopaedic research projects, presented locally and nationally, and his articles are published in numerous peer-reviewed journals. Dr. Shepard has served as physician for the Canton Ballet, Canton Crocodiles, and Canton Invaders. He is also a former assistant team physician for the Los Angeles Dodgers, Los Angeles Rams, Los Angeles Kings, Los Angeles Lakers, Anaheim Mighty Ducks, California Angels, USC Trojans, Loyola Marymount Lions, Yale University Athletics, New Haven Nighthawks, Senators professional and minor league hockey, and New Haven Coasters professional roller blade hockey. He is an active staff member at Mercy Medical Center and Aultman Hospital. Dr. Shepard has a wife and three sons. He is a runner and has completed two marathons.